I am very fortunate to be able to visit Cluj quite often. We all know a little about the city from Paddy’s visit here during his brief love affair with Angéla in the summer of 1934. Today I find myself here again after a busy week in my company office. It is a cold overcast day, and the low cloud seems to make the sounds of the city travel a long way; the squeals of children playing, dogs barking and the famous Cluj crows cawing as they weave their way between the apartment blocks and the spires and domes of Cluj’s many churches. Romania is not a country that many people visit on holiday, and Cluj is almost certainly not on many lists. I fail to understand why this is. You only have to visit the (open to public) Facebook page of Visit Romania and look at some of the incredible photographs to see that this country has varied and stunning scenery, and enough history on offer, from the Roman site at Parolissum, the artistic beauty of the painted monasteries of Bukovina or the wooden churches of Maramureş, and the castle of Hunyadi that Paddy visited during his walk south in the area of the Retezat on towards the Danube and the end of his journey as described in Between the Woods and the Water. 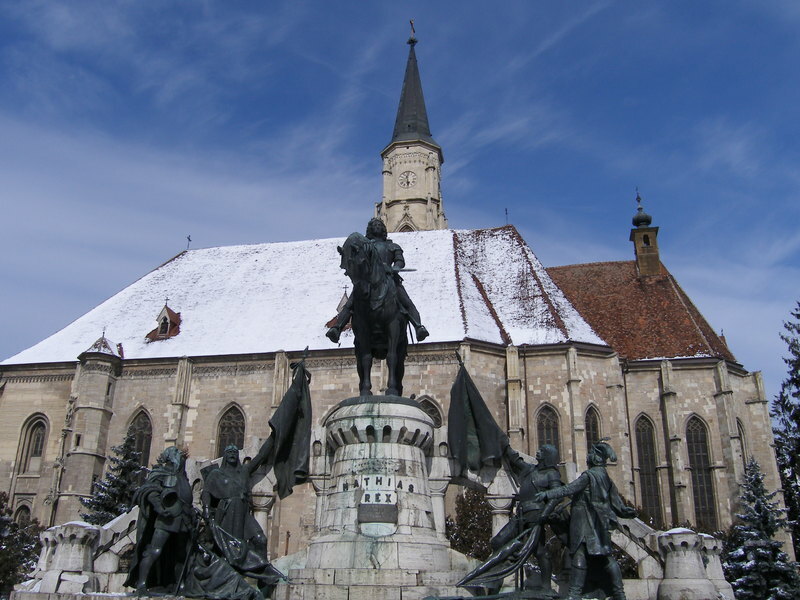 At its heart Cluj has wonderful Baroque architecture which dates from its heyday under the Austro-Hungarian Empire. Many of these buildings have fading, crumbling facades. The absence of western chain stores means that the streets are not despoiled by those so familiar signs. I may be wrong, but this general absence of branded outlets means that many Romanians (but to be fair probably only those that can afford it) still have a very individual sense of style. When one wanders just a few yards from the main roads in Cluj one enters a maze of smaller streets, many cobbled, with a myriad of bars, cafes and restaurants which all offer excellent value. Today I walked from the newly restored and very splendid statue of King Matthias Corvinus, past St Michael’s Church, towards Corvinus’ house. It is only a one minute walk. Paddy and Angéla stayed somewhere in those back streets within the sound of the bells of the church; quite where we shall probably never know. I too heard them ringing this evening as I walked to dinner. Cluj is a very sociable place, possibly because there are something like 100,000 plus students here (an incredible number but that is what I have been told). It is also somewhere that makes you feel quite safe. I am sure it has its moments, but I have never encountered any problems and one feels safer here than in many places in England, particularly late at night. What started out as just a short article about Cluj today, seems to have ended up as copy for the Romanian Tourist Board, and that is fine. In these difficult financial times, Romania offers a tremendous holiday alternative, and it remains low cost. So when making your plans for 2011 you could do worse than visiting this country, and possibly walking in some of Paddy’s footsteps. Romania could also do with the income. I call that a win win outcome. 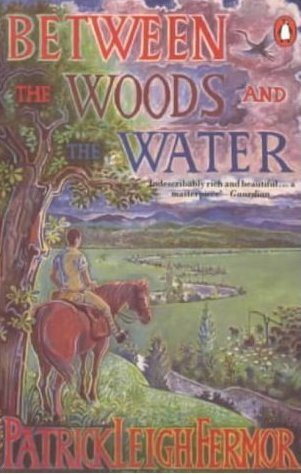 This entry was posted in Between the Woods and the Water, In Paddy's Footsteps and tagged Between the Woods and the Water, Cluj-Napoca, Patrick Leigh Fermor, Romania on December 4, 2010 by proverbs6to10.